When I started teaching – hard to believe now – it was in front of a blackboard, the heel of my hand permanently chalky. But a few years later, a brand new interactive whiteboard was installed in my classroom. For the uninitiated, this now-standard (in UK classrooms at least) piece of equipment uses a special stylus to interact in real time with whatever content has been projected from a computer onto the board. On initial set-up, the view from the projector has to be calibrated with the board itself. Now, that school may have been up to date with the latest technology, but my classroom was a hut. Our department taught in a set of ‘temporary’ overflow classrooms (never mind that when I moved into mine I cleared several years’ worth of tests and paperwork out of the cupboard…). Actually, our huts were pretty comfortable, and kept us away from the bustle of the rest of the school, but the wooden structures were not the most robust, and with the bell each hour came hordes of teenagers thundering up the walkway. So every few days, my taps and writing on the board would go slightly off-kilter, till I would have to aim for a couple of centimetres away from my target to make the right connection, and it was time to recalibrate. The software would present me with a neat grid of dots, each to be tapped in turn and in order. Then, for the next few days, I knew where I was. I could tap and write on the board with confidence, knowing that my aim would be true. I’ve recently seized on this word to help me navigate the rhythm of our life and our year. Each move to a new place requires recalibration. Everything is a bit off, not quite where you want it to be. Despite research, planning and whatever expectations you might have, you have to shift your position, adjust your aim. If only I could pick a day to line up the dots and have everything fall newly into place, but of course it takes time and effort, and is an ongoing process. And even though this year we haven’t moved to another country, I’m still being regularly shaken up. This summer I joined the exodus of expats who head home for the summer. (This is the first country we’ve lived where I really felt it was necessary, and the first time the children have been old enough for it to make a difference.) Much as I relish the opportunity to connect regularly with my roots, and introduce the children to theirs, there’s more recalibration to be done in the shift between cultures and lifestyles, back and forward. Not to mention the French school holidays that seem to pop up every 6 weeks (well, that’s because they do…). Just as the full-time or most-of-the-time parents are getting into the rhythm of school drop-offs, extra-curricular activities and finding time in amongst it all for their own work or pursuits, it’s about time to start planning for the upcoming holiday: travel, or activities to keep the children busy. Each transition triggers some degree of recalibration, getting the dots in a row. Unlike some people I know (Marvel! As Canadian Expat Mom seemingly publishes an awesome book literally between countries!) I find it hard to focus on creative tasks during the shaken-up times. I struggle to compartmentalise and end up holding too much in my head at once. I tell myself, Once things have settled down/the kids are more occupied/ the shipment arrives/ the apartment is set up/ the holidays are over…I’ll be able to focus properly. However, I am getting better at ringfencing moments of the day, and finding strategies to keep me motivated. ‘Think…aim…try…’ – the language is telling. Meanwhile another voice in my head was telling me There’s no way you’ll feel ready for that in this chaotic life you lead! My optimistic side was full of affirmations that this is June! November is nearly a whole half-year away! Months of prep-time! Even though I knew that summer in a new house would mean those months would also be consumed by recalibration. But I signed up for NaNoWriMo (National Novel-Writing Month – an online challenge to write 50000 words of a novel in November – around 1600 a day). And the timing was with me. Because then the very talented and thoughtful writer Rachael Stephen, author of State of Flux and How to Build a Novel (also a former student of mine – I state this with pride but claiming zero credit) announced her Prep_tober project – she’ll be generously releasing videos, tweeting and holding meet-ups in Glasgow to help plotter types feel ready for NaNo. So I signed up for that too – well, the virtual element of it. If it sounds like something you’d benefit from, in Glasgow or otherwise, please click through here for more info. In four days it will be October. I’m not ready, I’m not recalibrated, my dots are not lined up. I have only the vaguest ideas of what I might be planning and writing. But thanks to a-few-weeks-ago-me, I’ll be carrying on regardless, and getting some work done. Maybe even 50 thousand words of work. I’ve seen a few posts recently from perhaps more seasoned wrimos, full of hefty goals for the month of November. 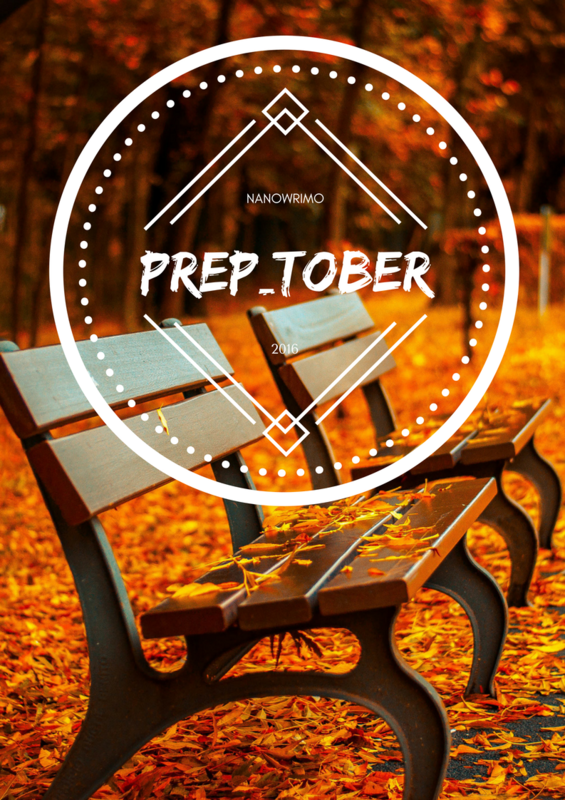 With the delusional optimism only a novice can embrace, my goal so far is: Prep_tober Week One: Pick a Project. I don’t feel ready for that either. But that’s a problem next-week-me can solve. I am also slightly terrified about trying to fit all of Prep_tober and NaNoWriMo into my life this year, you’re not alone! Nanowrimo is great – I’m a big fan. Writing is a muscle and Nano is great for building speed – while cutting yourself lots of slack on the quality front. I’m fishing about myself for ideas just now and right now I’m drawing up a map of where I think its going to happen. In a week I’ll throw in some of the residents and then see if they feel like producing a plot notion for me. At this point I’m not even sure if I want to write a novel, or stick to short prose for the time being, but I want to exercise the muscle in exactly the way you describe. Better to experiment with the form for a month than for a plodding year or more. And then have 50k words (maybe) of fiction to play with. Good luck to you too!